This feature film from Gaumont Studios came out while Louis Feuillade was in the midst of his brilliant serial Fantômas, but comes from a very different director, Léonce Perret, who also gave us “Les mystere des roches de Kador” in the previous year. In style and plot, this is a much more lyrical storyline than the anarchic crime serials Feuillade was working on at the time, but it bears some similarity to earlier work he did at Gaumont. The movie begins by introducing the major characters in close-up, some with clips we will see later in the film. There is a surprising number of them, and it’s unlikely that many will stand out as we wait a half hour or more for them to be introduced, although the fact that the only female character introduced is a small child (played by Suzanne Privat) is noticeable. As the story begins, that child is happily ensconced in a loving middle-class home, with a father, a mother, an uncle and an affectionate nanny. 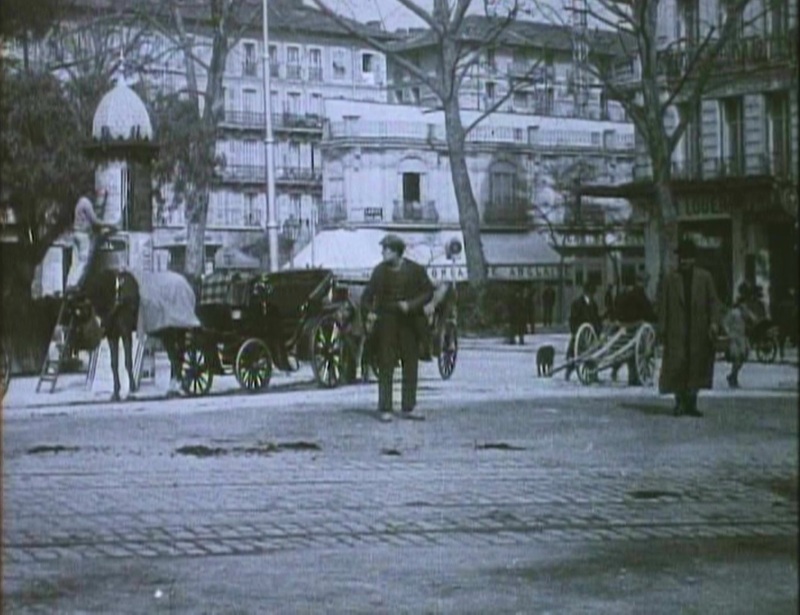 Then, the father, a captain in the army (Émile Keppens), is summoned to duty in one of the Moroccan Crises, leaving the care of his wife and child in the hands of his brother. There are some very stagey battle scenes, but for the most part we find out about his exploits through a series of telegrams sent back home, where the child continues to play happily and eagerly runs up every time there is news of daddy. Eventually, of course, the dreaded telegram comes informing them that the father has been killed in action, and that his body has not been recovered. The mother, who had moments before been frolicking with the daughter and a large ball, suddenly collapses with grief. Despite various concoctions prescribed to her by a “psychiatrist” (including morphine and ether! ), she also dies. Now the child is an orphan, though her uncle does his best to console her. Then he, too, is called up, and has no choice but to instruct the nanny to deposit the child in a boarding school. She is miserable there: the other students pick on her and make her a “scapegoat” for their bad behavior, and the teachers are cruel and unsympathetic. Naturally, she runs away one night when everyone is asleep. Now she is alone and defenseless on the streets of Paris. Perhaps she is looking for her home, but she has no idea how to get there. After hours of wandering the streets, she collapses from exhaustion, exposed to the elements on a street corner. She is found by an unseemly fellow known as “The Graduate” (Louis Leubas), who proceeds to take her rings and an identifying necklace while she sleeps. He is about to leave with his booty, when he seems to have second thoughts. He picks up the girl and takes her to a drunken cobbler (Marc Gérard), who takes her in and puts her to bed in a small loft-space or cupboard with no real mattress. She has to share this space with Bosco (Maurice Legranée), the hunchbacked assistant to the cobbler, who has soft, effeminate features and seems to fall in love with the little girl as soon as he sees her. The cobbler is cruel to her and refuses to give her bread if she doesn’t work hard enough, but Bosco waits until he passes out drunk and sneaks food in to her. The nanny has not been idle. She goes to the police and initiates a search for the missing child, blaming the school for her disappearance, but the police can do nothing. Now she gets a sudden telegram from the father – he’s alive after all! We see newspaper stories telling us that he was assisted by a “sympathetic Moroccan woman” and hidden until he could return to France. He has heard about his wife’s death, but looks forward to seeing his daughter again. There is a triumphal ticker-tape parade for his return, during which he learns the truth. He seems completely deflated. Why did he bother to live, if everything was to be taken from him? Now the Graduate figures out that he’s on to something. He recognizes the officer’s name from the identification medal he pawned, and writes out a ransom note to the captain and arranges to meet him with a gang of “associates” on hand. Although the captain does bring a pistol (he’s no fool), he is forced to write a check for 50,000 francs. The Graduate takes this money and goes to the cobbler, offering him 100 francs to get the child back. The cobbler is thrilled – think of all the wine he can buy with 100 francs! – and willingly surrenders the child. Bosco is suspicious, sure that the Graduate is up to no good, and so he follows them, then reports the location of the meeting to the police. The father and child are thrilled to see one another, but the Graduate isn’t willing to end his little game. He now demands an additional 50,000 francs. The father reluctantly begins to write the check, but suddenly the gang clobbers him and ties him up. Now the police rush in and begin making arrests. They find the father and release him from his bonds, but the Graduate has snuck off with the child. Familiar with the ineffectiveness of the police, Bosco writes a note to the father informing him that he will conduct his own investigation. He trails the Graduate to a train bound for Nice and sees him take a cab from the station. Then, alone and penniless in a strange city, he finds a place to sleep under a tree in a park. The next day he awakens dirty and hungry. While he ponders his next move, a rich woman gives him a coin. He runs after her to return it, protesting that he is not a beggar. The woman is so charmed that she takes out a 100-franc note and forces it on him. This is enough money for Bosco to get cleaned up, buy new clothes, rent a hotel room, have a sumptuous breakfast and send a telegram to the father, letting him know where he is and what he has found. Now he finds the cabby he saw drive off with the Graduate and pays him to take him to the villa where the child is hidden. He sneaks in and breaks down the locked door to her room, then spirits her back to the hotel without being detected. He sends word to the police as to the Graduate’s whereabouts, and they catch him climbing over the wall of the villa, following Bosco’s trail of broken branches. The daughter is returned to her home and the captain adopts Bosco as a reward for reuniting his family. 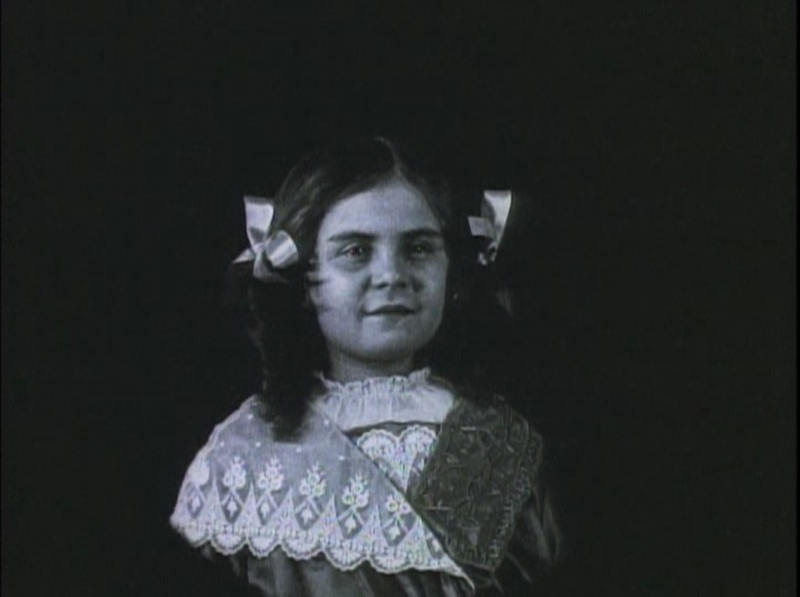 This movie also has a surprising amount of opening credits for 1913. I suspect that these have been added by Kino or Gaumont for this 2009 release, and were not included in the original print. Giving any credits was unusual at the time, but these give not only a lengthy list of actors and the director, but also the screenplay, art direction, and cinematographer. The reason this matters is that the list of actors here differs from what is given on imdb. Here, actor René Navarre (known for “Fantômas”) is billed as “Chief of Police.” He does not appear as one of the actors shown in close-up, however, and I wasn’t sure I spotted him. He could have been the fellow who informed the nanny that the police were giving up the search, but that’s a pretty minor role. Imdb doesn’t list him at all for the movie, so it could be a mistake, although I would regard Kino as more authoritative than imdb. Imdb also fails to list the cinematographer. The narrative struck me as somewhat unconventional. At first, I thought I was seeing a domestic drama, with a focus on the relationships among the adults, then it shifted to kind of a “Little Princess” storyline, and then suddenly the focus was on the Paris underworld. As we moved through these stories, the “star” of the show changed too: at first it seemed to be the captain, then the child, and finally Bosco. I actually somewhat enjoyed the way the protagonist changed during the course of the film, making it feel like we got the chance to meet new characters and get to know them as the story progressed. The one part of the narrative that didn’t work for me was the Graduate’s taking the child to Nice and locking her in a villa. What was his motivation for doing this? The only way he could make money by kidnapping her was to sell her back to the father, who was in Paris. Keeping her just meant added expenses and risk for him, with no clear benefit, and hauling her off to another city served no apparent purpose. Now, although I’ve complained about the Nice sequence in terms of the Graduate’s motivations, it does allow Perret to make some interesting observations about class in French society. When Bosco takes his 100 franc note to a café and asks for service, the waiter chases him off because of his dirty clothes, ignoring the money. Bosco has to buy a new suit before he can get service. He also makes a big deal out of the soft hotel bed – which is unlike any he’s ever slept on, and there seems to be a moment when he reflects sadly that the child had been used to such luxury before she fell into the Graduate’s hands (I could be reading that in myself, no title card cues us as to what he is thinking). In a way, much of this movie is about the tragedy of a child losing her middle class comforts, and about how the basic decency of Bosco allows him to move from poverty toward a more “normal” middle class existence. For that reason, I think the sequence in Nice was important to the narrative, I just don’t think it was set up properly. There’s an interesting bit in a newspaper clipping during the father’s military service about how the Moroccans have “advisors” with “strong German accents. This reflects the tensions between Germany and France even in the years before World War I, and the fact that they were already in undeclared/indirect conflict repeatedly during the final years. Most of the movie is edited in sequence, with each scene playing out before moving on to the next one, although there is some cross-cutting in the sequences when Bosco follows the Graduate and calls in the police. The real strength of the movie, however, is the photography by Georges Specht. 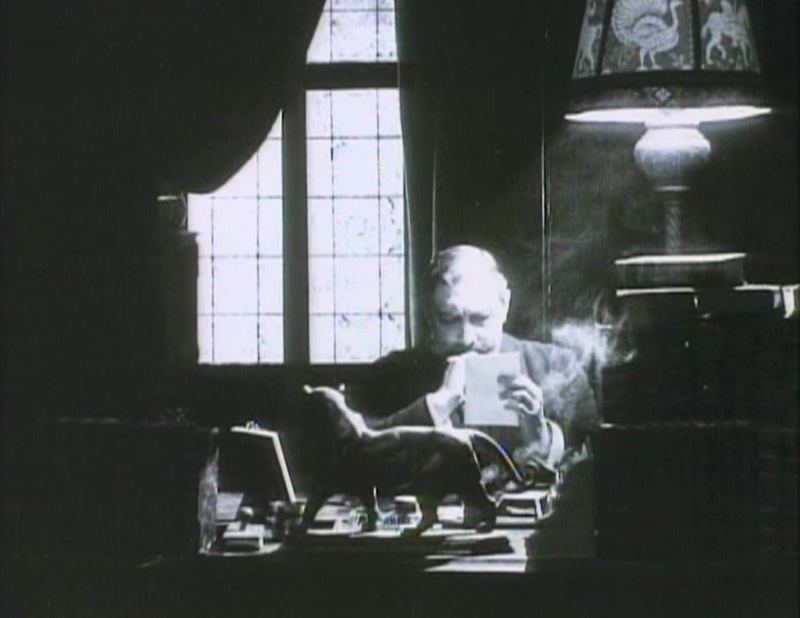 There are a number of interesting backlit scenes, as well as some shots which are much darker than we usually see in movies from the time, including the “dark” themed crime movies of Louis Feuillade. 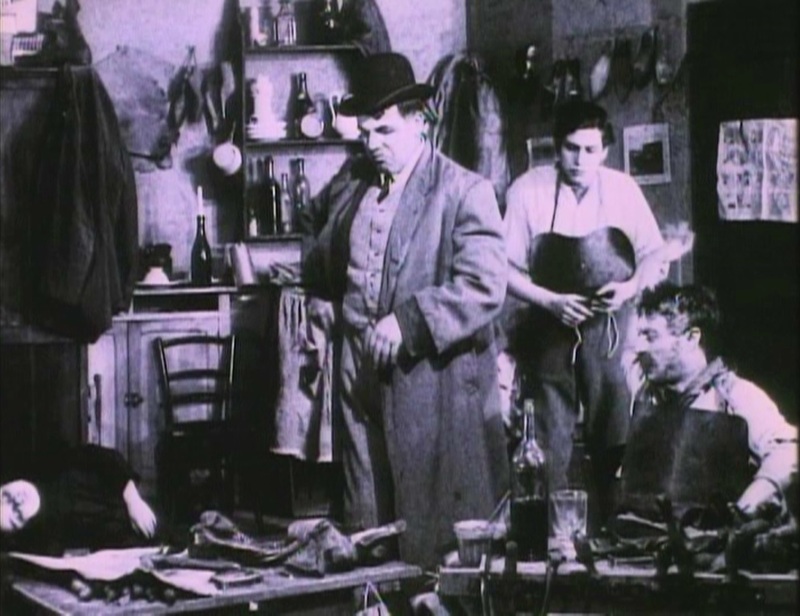 The use of mise-en-scene establishes the contrast between the comfortable and opulent home of the family, and the squalid conditions of the cobbler and his underworld associates. I found it to be a technical as well as a narrative success. I have not found this movie available for free on the Internet. If you do, please comment.